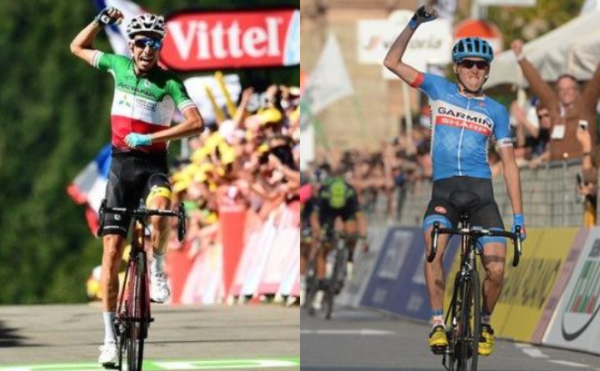 Dan Martin’s new manager at UAE Team Emirates has now said Fabio Aru and the Irish rider may both ride the Tour next year. Martin had suggested Aru would do the Giro and he’d be team leader for the Tour. Dan Martin’s new team has said it was not a foregone conclusion he would get a free run at the Tour de France next year while Fabio Aru focussed on the Giro. Both the Irish and Italian Grand Tour contenders have signed for UAE Team Emirates. And Martin himself has suggested they would fit into the same line-up because he would aim for the Tour and Aru for the Giro. Dream move or biggest gamble of Dan Martin’s career? However, Carlo Saronni has said it was still possible Aru would ride the Tour de France next year. He also believed that because Aru was not yet 30 years old he could still improve. But he felt the team was workable with three leaders in the shape of Aru (27), Dan Martin (31) and Alexander Kristoff (30). Saronni suggested it would take a number of years before the team was at its best, saying by 2020 it wanted to be the best in the world. “I think that it’s possible to be on the podium in Grand Tours next year,” he told cyclingnews. “Maybe we don’t yet have the teams to support that 100 per cent but we have good guys and some young talents. “That challenge won’t be easy but I think it’s achievable. We saw this year that without his crash, Martin could have been on the Tour podium. “The first impression is that Daniel had a great Tour and Fabio also did well there too. “Fabio is an Italian rider and he’ll look at the Giro but just because he’s Italian it doesn’t mean he will do the race. “Maybe we’ll have them both at the Tour but one possible calendar for Fabio could be the Giro, Vuelta and then the World Championships, with Dan targeting the Tour de France. Aru’s former team mate Paolo Tiralongo has also joined UAE Team Emirates as assistant director sportif. “Fabio has shown that he’s one of the guys who can fight at the top level with Nibali, Froome and Quintana,” Saronni said.